I’m probably being a bit on the generous side by awarding a goal to Theresa May in last night’s TV leader’s debate, but I still viewed it as a victory for the Labour leader, Jeremy Corbyn. Of course, the Tories and their friends in the media are claiming victory in the debate, or at the very least a draw, but that is just spin. The debate was split between questions from the audience, made up of one third Labour, one third Tory voters, and one third undecided, and an interview with veteran broadcaster, Jeremy Paxman. There was one incident when May said that Labour’s figures ‘didn’t add up’ that brought a rather mocking burst of laughter from the audience. It was noticeable that the Tories back of fag packet plan to pay for social care went down badly, even it seemed with Tory supporters. May looked like she has had some media presentational training for this event, but she still looked awkward and I found myself stopping listening to her long winded reciting of prepared lines, and it looked like the audience had a similar feeling. In the second part of the debate, Paxman’s interview section, Corbyn was given a pretty rough time with questions about the IRA, Islamic terrorism, the nuclear deterrent and even the Falklands war, which is hardly very relevant. Paxman constantly interrupted Corbyn’s answers but he did well to parry these questions and rarely looked under pressure. Paxman’s questioning of May was altogether much softer, throwing her some patsy questions on Brexit towards the end, but Paxman did perhaps come up with the most memorable line in the whole debate, when he accused May of being 'a blowhard who collapses at first sign of gunfire?’ May didn’t look happy at this description. I have awarded May one goal, because of the audience reaction to her claim to be a tough negotiator, although it isn’t clear to me that she would be any good at the Brexit negotiations, we just have to take her word for it, it seems. The decision by the Tories to make May personally the focus of their campaign now looks to be a miscalculation. She has avoided any direct debate with Corbyn, but what little the public are seeing of May, under some pressure, surely can’t be left with any other conclusion than May is limited and robotic, lacking any warmth and charm, and to be frank, a quite weak looking figure. 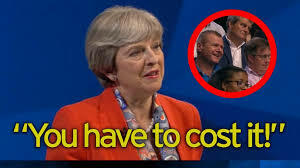 For the Tories and some in the media to claim this debate as a victory for May, or even a draw, is not in the least supported by what I saw on TV last night, but perhaps that is not the point of the Tory spin. Many, probably most voters will not have seen the debate, and may be fooled into thinking it was draw. Corbyn was the clear winner. Why is May Taking a Risk with Core Tory Voters?